Before the advent of photographic technology, the invention of comics attempted to address the cultural changes taking place alongside the Industrial Revolution and, as such, can be situated as one of the earliest inventions in media rhetorics in the age of electracy. Contra traditional (read: Classical) and vocational (read: technical) education, graphic storytelling was designed to foster traditional elements of rhetoric and arts/humanities education for an emerging cultural moment during the early- and mid-nineteenth century. It was an attempt to test and re-shuffle the histories of rhetorics and philosophy to invent a new mode of discourse for the coming age of mechanical reproduction. 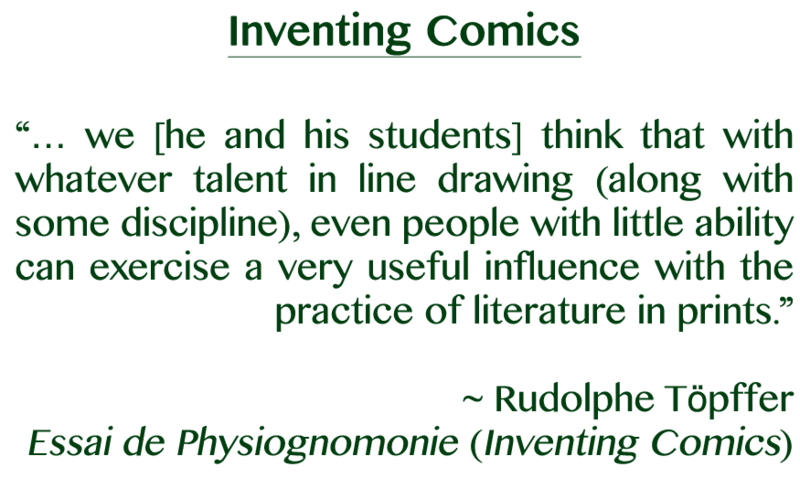 Evidence for this claim is straightforward: as Rudolphe Töpffer, the so-called ‘father’ of the comic strip,  explains, the invention of the graphic novel was the manifestation of an attempt to discover a "métaphysique pittoresque" [an image metaphysics] ("Essai" in Inventing Comics). And, the invention was, in part, a response to the challenge facing the arts and humanities in adapting to a new student demographic, 'pupils' from the lower classes who were only recently being granted access to these institutions of learning. Noticing that these students were ill-prepared and uninterested in Classical education (i.e., Latin for Latin’s sake), Töpffer started to experiment with an alternative "language," putting his students to work "using the tools [they] preferred, by which [he meant] pens and paper; sketching images in [their] notebooks in such a way that you would have found a beautiful Roman slaying a Carthaginian instead of a single word of proper Latin" ("Of a Genevan Painter" in Inventing Comics). All of which seems to have been a response to Hegel’s recent work on the history of philosophy and philosophical analysis of the fine arts. In fact, the "process that is common to all" constitutes one of the guiding principles of Töpffer’s method, a principle that seems to have been the product of a personal frustration. Initially intending to pursue a career as a fine artist, like his father, he was diagnosed with a degenerative eye disease while studying rhetoric, philosophy, and the (sister) arts in Paris. "Rather than give up on the fine arts, Töpffer's extensive (but mostly untranslated) body of work suggests that the comics mode was a way to develop a broader rhetorical theory of media and aesthetic practice, informed by the sister arts and designed for the post-industrial age (cf. Reflexions d'un Peintre Genevois: Sur Le Beau Dans Les Arts, 1858). In my forthcoming translation of two essays by Töpffer,  I argue that the history of comics is not only a part of the history of rhetorics, but of electracy, chronologically before the invention of photography. Textbook subjects (from left to right): Rhetoriqué, Algèbre, Géographie, Grec, Latin. I have in mind a remake of electrate theory tour practices grounded in these travel journals, journals that detail the rationale, purpose, method, and results of the summer excursions across the Alps, where Töpffer and his students experimented with documenting the mood of various sites they visited between 1822-1842. In working toward this remake (postponed), I want to do three things in this essay: (1) offer a translation of excerpts from three of Töpffer's travel journals (collected in Nouveau Voyages) as a starting point for the remake (Section I); (2) review a selection of contemporary experiments on site-specific and location-based comics, based on Scott McCloud's concept of the infinite canvas and the concept's application to spatial environments in Daniel Merlin Goodbrey "hypercomics" and Özge Samanci's experiments with geo-graphic storytelling  (Section II); and, (3) from this juxtaposition, introduce the beginnings of a comics based inventional consulting practice (kónsult komics) a group of students in my "Writing Graphic Novels" Fall 2015 course began working out. My plan is to work through this remake conductively, "following a thread rather than a story or an argument," and examine these scenes “in terms of an invention that might be found” in them (Ulmer, "Kubla Honky Tonk" 265-266). What I hope to find is a practice that functions in the mode of kónsult, "by means of mobile ubiquitous computing, enabling the egent (consultant) freedom of movement in space and time (GPS and EPS [Existential Positioning System])"; a "holistic orientation" that employs "resources not only from one's specialized discipline, but from the divisions of knowledge as a whole," including the "institutions of society … such as governments and corporations [and] the egent's home and family context plays a central role"; a genre that "supports holistic learning, mediating collective attunement among collaborating consultants and institutions"; a consulting practice that serves an "advisory function relative to contemporary global civilization" and "grounded in a site of disaster (a public policy aporia)" ("Kónsult"). As we'll see in Section I, Töpffer's pedagogical excursions address such public policy aporia before the emergence of mobile computing, which may help to inform future kónsult practice—or, at the very least, offer historical justification for this kind of work. In Section II, we’ll see contemporary projects attempting to adapt traditional graphic storytelling practices to the use of mobile computing technologies, although stopping short of an inventional consulting focus. And, in Section III, we will see an experiment in graphic storytelling that serves, in my view, as a foray into a(nother) theory-hobby genre: kónsult komics. One of the more interesting experiments in Töpffer's development of the graphic novel was the practice of taking students on summer field trips across Europe. As the image above represents, this was a time to get away from the standard curriculum (general education) and to test it the field. The excerpts below are reports of the results of those experiments and, when juxtaposed with the Florida Research Ensemble's (FRE) experiments in inventive consulting (rather than traditional consulting; the 'booster' mood), offer a starting point for bootstrapping another step in "the formation of an image category" (Miami Virtue 5)—or, in Töpffer's terms, an 'image metaphysics.' Specifically, both represent "a theory of the logic of images" in civic life (Miami Virtue 6). Where they differ is more obvious. Where the FRE’s experiments are "intended as an Internet practice" (Miami Virtue 6), Töpffer & company's experiments were intended for sketchbooks. Despite these differences, both share the goal of doing for the image "what the Greeks did for the written word – define and test its categorical function" (Miami Virtue 7). My purpose in translating excerpts is to present a relay for designing another, supplemental approach to the theory tour practices tested by the FRE. You might call these excerpts material in my (Duchampian-Ulmerian) valise, informing the method at play in this essay. For Töpffer, these field trips functioned as a way of addressing the changing social, cultural, and political changes happening across Europe as the Industrial Revolution went into full swing. Moreover, as Thierry Smolderen claims, "if one reads the serious and the comical sides of the Töpfferian oeuvre concurrently … it becomes clear that the visual language of progressive action that he put together combined all the systems, all the injunctions, and all the models that characterized, to his eyes, the stupidity of the industrial world" (47). Briefly, this amateur art (comics) and tourist practice (sketchbook/travel-journal) emerges at the historical moment marking the transition from literacy to electracy, and thus offers a starting point for testing the applicability of a similar practice in our contemporary age of automation. Selections from Nouveaux Voyages en Zigzag, translation and original. In his 2000 book, Reinventing Comics, Scott McCloud introduced the concept of the infinite canvas, treating the computer screen not as a page, but as a window. Almost a decade later, McCloud returned to the concept on his website, writing that the concept identifies "a challenge to think big" in relation to the basic premise "that there's no reason that long-form comics have to be split into pages when moving online" ("The 'Infinite Canvas"). In the years since Reinventing Comics was published, various artists have experimented with this "window" metaphor, inventing new (rhetorical) genres of graphic storytelling. For instance, see Daniel Merlin Goodbrey's Hypercomics: New Experiments in Fiction; Stu Campbell's interactive comics, Nawlz; Ryan Woodward's animated graphic novel, Bottom of the Ninth; and Mattis Dovier's (in collaboration with Wild Beasts) interactive GIF-Novel for The Jameson Works. Still, each of these projects pale in comparison to the experiments in graphic storytelling produced by new media artist Özge Samanci. Samanci grounds this approach to location-based comics in contemporary art practices, detailing the relationship a work has with space: "the space referenced by the artwork, the space in which the artwork is perceived, and the frame that points out the boundaries of the artwork or lack of frame that blends the piece to the environment in which it is perceived" ("From Site-specific Comics"). And her first experiments with this method parallel Töpffer's methods. Describing the first of her three experiments, Ordinary Things (a webcomic), she tests the potential of site-specific art; each entry focuses on observing a particular object in a particular location, and documenting the "lived experience" of that object in that location (read: kairos). The primary difference between this project and Töpffer's graphic travel journals is the mode of distribution. Even though Töpffer published his (and his students') observations as pamphlets/books and Samanci uses a weblog, both are engaged in experimenting with a method of observation in the mode of an "image metaphysics" mediating essence and appearance. The second experiment, Planting Comics, retains the method of “observation” from the Ordinary Things, but adds a narrative element to the first piece and involves an alternative medium, which is designed for a particular site: the University of California Botanical Garden in Berkeley. As she writes, each "comic" in the series "refers to a nearby plant, view, or detail in the physical environment" and is designed to lead visitors "on an art hunt in the garden by using a [paper] map" to "find all twenty comics" with which participants "create their own comic plant story on the back of the map" ("From Site-specific Comics"). Samanci states her primary aim in this experiment is to place "comics outdoors," and to motivate artists "to go beyond the typical art materials used in traditional comics production"—e.g., the pens and paper Töpffer's students used in their experiments. Using ceramic tiles and metal (for stands to hold the tiles) emerges from the need to account for environmental conditions, such as "the decaying effects of water" [rain] and debris ["leaves and dirt"], as well as the potential for "vandalism and theft" ("From Site-specific Comics"). Briefly, Planting Comics marks a shift in the graphic storytelling tradition that Töpffer initiated in the nineteenth century. Where Töpffer writes graphic stories of geographies (literacy), Samanci writes graphic stories with geographies (electracy). Where Töpffer's invents an image metaphysics capable of representing the mood of spaces (the graphic novel; literacy), Samanci invents one capable of writing with the mood of spaces (embodied, geo-graphic storytelling tours; electracy), extending the observational mode employed by the former. Wrapping up her discussion of the Planting Comics, Samanci offers a suggestion for artists interested in implementing a similar idea: "by using GPS technology, the digital environment will not allow the decaying effects of an outdoor setting, vandalism, and plant growth covering tiles." Moreover, GPS technology can allow visitors to "post their [own] drawings onto a map in a GPS-based version of Planting Comics," conveying "the voice of various visitors instead of one artist" ("From Site-specific Comics"). Although, as she notes, issues of accessibility (e.g., visitors without a smartphone) and attention (e.g., divided between screen and environment) will continue to persist. Regardless of these concerns, Samanci's third experiment explores how GPS-enabled devices can "make the best use of the affordances of location tracking technology for comics storytelling" ("From Site-specific Comics"). GPS Comics, the third and final experiment in this series, bridges the observational modes of Ordinary Comics and the practice of writing with environments to invent a kónsult-like practice. With this project, Samanci and her collaborator, Anuj Tewari, "aimed to create a location-based comic story with a GPS environment," one in which the "participant [or, "player"] must experience a sensory detail (a smell, sound, breeze or an object) in her surroundings in the physical world" ("Expanding" 27). The narrative/game takes the participant on a tour of a defined space—a four-mile radius in Berkeley, CA—to find love, and begins when "the player hits the start button" to activate an animated Cupid shooting the player with an arrow in preparation for 'falling in love'" [see video below] ("From Site-specific Comics"). GPS Comics: Seeing thru Walls (Demo), by Özge Samanci and Anuj Tewari. In designing this narrative experience, Samanci explains that choosing locations that will keep an "identifiable quality for the longer term" is one the of the more pressing concerns ("From Site-specific Comics"). From a designer's (methodological) point of view, Samanci's practice gestures toward the potential of inventing a new mode of surveying "the psychogeographical articulations of a modern city," aided by "old maps, aerial photographs, and experimental derives [to] draw up hitherto lacking maps of influences" and "of changing architecture and urbanism" ("Theory of the Dérive"). Or, in more recent terms, Samanci's method reflects the kind of work that Thomas Rickert calls for in Ambient Rhetoric: to compose "an interactive place, one no longer bounded exclusively by considerations of physical dimension or determined by overemphasis on a particular, isolated mode," but rather, one which is rhetorically "enmeshed within ambient environs, evoking (but not demanding) a rich panoply of attachments, feelings, responses, and possible (inter)actions" (143). Upon an initial inspection of Samanci's work, I had a similar response to that of Goethe after he perused Töpffer's first graphic novels: what if we were to test Samanci's location-based storytelling practices as a mode of civic discourse? Upon a closer analysis, my response shifted toward Roland Barthes's take on the graphic novel (in a footnote from the essay, "The Third Sense [Meaning]"): "I am convinced that these 'arts,' born in the lower depths of high culture, possess theoretical qualifications and present a new signifier (related to the obtuse meaning)" (Image 66). For instance, in place of a love story, how might Samanci's method be re-motivated to address social, cultural, and political issues of contemporary life? What is the potential of this method in relation to what Ulmer calls theory tours, designed to explore "those events that are unnoticed but that have a strong impact in the social, political, and economic lives of millions of citizens (e.g., gun violence, car accidents, and domestic abuse)" (see CFP for volume 2 of Textshop Experiments)? My initial answer came during the Fall 2015 semester, when I taught a course on the graphic novel as literary genre, focused on its historical and ongoing invention—the invention of new modes of public discourse rather than the use of those already available. Töpffer's essay describing his motivations and theoretical (rhetorical) approach to the invention of the genre and Samanci's recent experiments with geo-graphic storytelling bookended the course unit on graphic novels and media. The next section of the course addressed processes for inventing, developing, planning, and producing a graphic storytelling project. Students were first tasked with forming their self-selected group. Then, each member pitched a set of ideas to the group and, collaboratively, the group decided to either go with one of the ideas pitched or integrate aspects of each pitch into a new idea for the project. One group in particular  worked to adapt Samanci's site-specific and location-based method to address a public policy issue that plagues our (and a host of other) college campus(es): lack of sufficient parking. Since the student body in department where I work is composed primarily of Literature majors , the students in this group decided to address this issue through an analogy to and re-make of a literary 'masterpiece' based in memory-work: Dante's Inferno (cf. Calvino, Six Memos). Before beginning the project, students made sure to contact campus security to receive approval to work in one of the parking decks on campus—which they did receive after assuaging the security representative's concerns for their safety (e.g., not putting themselves in a position to be hit by cars) and that the narrative content would not violate the student code of conduct concerning offensive material. The security officials these students spoke with required that students only use non-permanent materials to compose their project. In response, students had their materials: the parking deck walls, sidewalk chalk, a still camera (on their smartphones) for photographs, a hashtag (#centralhell) to be used across social media platforms by players/participants, and a Tumblr account to record their work-in-progress. The group began and completed the project on a Friday, when the deck was mostly empty; by Monday afternoon, the university maintenance team had already pressure-washed the walls, wiping away the students' work. Still, a record of this work remains available on the project's Tumblr page, Central Hell: A Site Based Comic at Kennesaw State University in the Central Deck. Even without reference to Ulmer's work (in the course), students engaged with theory tours by participating in the “historical process of inventing new programs for writing in all the media available” (Electracy 289), just as Töpffer and Samanci do with their graphic storytelling experiments. The most significant difference between Ulmer's work and the students' adaptation of the Töpffer's and Samanci's work relates to the technology used. Where Ulmer proposes that we stop "at various sites to photograph an arrangement" of materials, the students and comics-theorists propose that we doodle such an arrangement, reflecting Töpffer's critique of the image-machine (daguerreotype) offering "the body minus the soul" ("De La Plaque" 12). However, these students and their project reflects a kind of "basic methodology" of the emergent ontology of a "poetic encounter" (Ulmer, "Emergent" 320)–most obviously in a remake of Dante's Inferno (i.e., hell is finding no parking spot). Specifically, students grounded the project in the models of Samanci's experimental site- and location-based comics and employed the media most readily available to them (chalk, walls, a parking deck) to comment not only on the issues of space (and its lack on campus), but also on the existential experience of not being able to find parking. And, therefore, not being able to make it to class on time (if at all). The result is a performative consultation, one literally written on the walls of the space in which the problem is presented. It functions, in other words, as a kónsult, with a "freedom of movement in space and time" and "grounded in a site of disaster (a public policy aporia) selected by the egent [students] … [and] resistant to all solutions" ("Kónsult"): how to 'solve' the problem of parking at a university in an urban area with limited real estate. Here, I have attempted to trace out the relation among the rhetorical invention and re-invention of the graphic novel alongside kónsult with aim of "mediating collective attunements among collaborating consultants and institutions" (Ulmer, "Kónsult"). Töpffer’s Voyages reveals a similar aim in the summer field trips across Europe he took with his students, namely, using the "sixth sense" (mood/state of mind) to write and doodle their respective impressions of a given place. In Samanci's work, we see ambient environments and sensory details play a role in constructing narrative-meaning toward "increasing awareness about how our prejudices and stereotypical thinking affect communication process" (Samanci, "Expanding" 27). Finally, bringing Töpffer's and Samanci's rhetorical methods together, my students experimented with developing a potentially "unifying genre of learning in the digital apparatus" (Ulmer, "Konsult"). Still, these projects are more than models—they constitute a relay. While interesting examples of theory tours in themselves, these experiments carry the lesson of Töpffer's early electrate work: not merely to use the available media for kónsult practices, but to invent new media and practices appropriate to a given era. As I've shown, littérature en estampes [literature in prints], Töpffer's term for the graphic novel, is undergoing methodological transformation as comics-artists experiment with new modes of communication. Beyond digital, web, and GPS comics, other artists are experimenting with new approaches to the novel as a physical object. For instance, in May 2012, the comics-artist Seth described recent thinking (theory) about the genre: "I think that one of the important things in the last twenty years is that cartoonists have started to think of themselves as designers as well. … We've come to the point where you want to control the very form of how it will be presented" (Chute 154). I imagine Töpffer was at the same point in the nineteenth century, as are Goodbrey, Samanci, and others comics artists today. After more than a century-and-a-half detour, graphic storytelling has started returning to its early theoretical context: to write a mood of space and place in the mode of an image metaphysics. With these notes having theorized, analyzed and explained how graphic storytelling might compose "an interactive place" (Rickert 143), we are now ready, I believe, "to design some ACTIONS of our own" (Ulmer, "Theory Hobby" 300). Take a walk around your neighborhood. Doodle and describe those features that act as puncta (pl. punctum)—on paper or on the walls. Use a Tumblr or Instagram profile to document and file the process. Invite contributions from your neighbors. Organize a "kónsult komics hop" (in place of a bar-hop). Share widely—esp. with "other primary institutions of society …, such as governments and corporations" (Ulmer, "Kónsult"). Monitor your local environments. See David Kunzle, Father of the Comic Strip: Rodolphe Töpffer (Jackson, MS: University Press of Mississippi, 2007). James Findlater's graduate thesis, In it for the Money, is also an interesting example of using comics-related concepts and practices for designing and composing graphic stories for and in physical locations. See the full manuscript on Massey University's theses and dissertation website: http://mro.massey.ac.nz/handle/10179/3252. According to one of Goethe's editors, his response to drafts of Töpffer’s first graphic novels went like this: "If, for the future, he would choose a less frivolous subject, and restrict himself himself a little, he would produce things beyond all conception" (Eckermann, Conversations 503-504). While I'm choosing not to name the students who composed this project (due to privacy concerns), I am including their online documentation of the project posted on a public Tumblr (below). Our department is currently in the process of exploring options for introducing a professional writing/rhetoric major. How Töpffer ended all his manuscripts. Barthes, Roland. Image Music Text. Trans. Stephen Heath. New York: Hill & Wang, 1977. Print. Calvino, Italo. Six Memos for the Next Millennium. New York: Mariner Books, 2016. Print. Chute, Hilary (Moderator). "Panel: Graphic Novel Forms Today: Charles Burns, Daniel Clowes, Seth, Chris Ware" in Critical Inquiry: Comics and Media (Spring 2014): 151-168. Print. Debord, Guy. "Theory of the Dérive." Situationist International Online. n.d. Web. 23 Sept. 2016. Eckermann, Johann Peter. Conversations of Goethe with Eckermann and Soret. Trans. John Oxenford. London: George Bell & Sons, 1875. Print. Goodbrey, Daniel Merlin. "Foreword" in Comic Book Geographies. Ed. Jason Dittmer. Stuttgart (Germany): Franz Steiner Verlag, 2014. Print. McCloud, Scott. "The Infinite Canvas." Scottmccloud.com. Feb. 2009. Web. 23 Sept. 2016. - - -. Reinventing Comics: How Imagination and Technology Are Revolutionizing an Art Form. New York: William Morrow Paperbacks, 2000. Print. Propen, Amy D. Locating Visual-Material Rhetorics: The Map, the Mill, & the GPS. Anderson, SC: Parlor Press, 2012. Print. Samanci, Özge. "From Site-specific Comics to Location-based Comics: Ordinary Things, Planting Comics, and GPS Comics." International Digital Media and Arts Association. 28 Feb. 2013. Web. 13 May 2015. Samanci, Özge, and Anuj Tewari. "Expanding the Comics Canvas: GPS Comics." FnG '12: Proceedings of the 4th International Conference on Fun and Games (2012): 27-34. Print. Smolderen, Thierry. The Origin of Comics: From William Hogarth to Windsor McCay. Trans. Bart Beaty and Nick Nguyen. Jackson: University Press of Mississippi, 2014. Print. Töpffer, Rudolphe. "De La Plaque Daguerre: A Propos Des Excursion Daguerriennes." Geneva: Bibliothèque Universelle de Geneve, 1841. Print. - - -. Inventing Comics: A New Translation of Rudolphe Töpffer's Reflections on Graphic Storytelling, Media Rhetorics, and Aesthetic Practice. Trans. Sergio C. Figueiredo. Anderson, SC: Parlor Press, forthcoming. - - -. Nouveaux Voyages en Zigzag. Ed. Sainte-Beuve. Paris: Plot Frères, 1854. Print. - - -. Reflexions et Menus Propos D’un Peintre Genevois; ou, Essai Sur Le Beau Dans Les Arts. Paris: Librairie de L. Hachette et Cle, 1858. Print. Ulmer, Gregory. "Emergent Ontologies: A Lecture by Gregory Ulmer." Electracy: Gregory L. Ulmer's Textshop Experiments. Eds. Craig Saper and Victor Vitanza. Lexington, KY: The Davies Group, 2015: 301-322. Print. - - -. "Handbook for a Theory Hobby." Electracy: Gregory L. Ulmer's Textshop Experiments. Eds. Craig Saper and Victor Vitanza. Lexington, KY: The Davies Group, 2015: 287-300. Print. - - -. Internet Invention: From Literacy to Electracy. New York: Pearson/Longman, 2003. Print. - - -. "Kónsult." Theopraxesis: Learning Design Electracy. N.d. Web. 3 Oct. 2016. - - -. "Kubla Honky Tonk" in Language Machines: Technologies of Literary and Cultural Production. Eds. Jeffrey Masten, Peter Stallybrass, and Nancy Vickers. New York: Routledge, 1997. Print. Ulmer, Gregory L., Barbara Jo Revelle, William Tilson, and John Craig Freeman. Miami Virtue & the Ulmer Tapes. Small Cities 3.2 (2012). eBook. Wiese, Ellen. "Introduction: Rudolphe Töpffer and the Language of Physiognomy." Enter: the Comics. Lincoln: University of Nebraska Press, 1965. Print. Sergio C. Figueiredo is an Assistant Professor of English at Kennesaw State University. His research currently focuses on the work of Rudolphe Töpffer and Töpffer's place in the histories of rhetoric, writing, and media. Most recently, he has completed a translation of two essays by Töpffer on the invention of the graphic novel as a pedagogical exercise grounded in the histories of rhetorics (forthcoming from Parlor Press). He is currently working on a multi-volume translation of Töpffer's posthumously published monograph on the theoretical groundings of graphic novel—Reflexions D'un Pientre Genevois: Essais Sur le Beau Dans les Arts.